The narrator reflects on her grandparents and their experience with the Great Depression. When Grandpa Clarence loses his job, his wife and child Dorothy move to Idaho. They pick potatoes to earn money and trade them for other goods. Grandpa Clarence gets a new job and the family grows. The narrator thanks her grandparents help to influence her liking of potatoes. 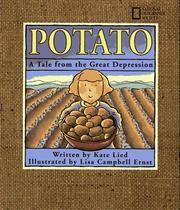 Lied, Kate, “Potato: A tale from the Great Depression,” Children's Picture Book Database at Miami University, accessed April 26, 2019, https://dlp.lib.miamioh.edu/picturebook/items/show/14001.